WASHINGTON, DC, June 21, 2010 (ENS) – The scandal-ridden federal Minerals Management Service is gone, at least in name. Today Interior Secretary Ken Salazar swore in a former Justice Department Inspector General to head the renamed agency that will oversee oil and gas development on the Outer Continental Shelf with tighter controls. 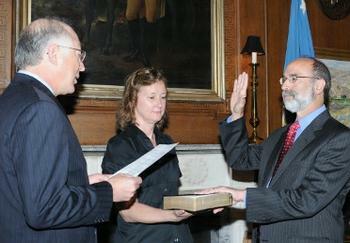 Michael Bromwich took the oath of office to head the agency, now to be called the Bureau of Ocean Energy Management, Regulation and Enforcement. It will be known, less formally, as the Bureau of Ocean Energy or BOE. Bromwich served as Inspector General for the Department of Justice from 1994 to 1999 during the Clinton administration and oversaw numerous high-profile investigations. Bromwich will oversee the fundamental restructuring of the former Minerals Management Service into three separate divisions – the Bureau of Ocean Energy Management, the Bureau of Safety and Environmental Enforcement, and the Office of Natural Resource Revenue. Bromwich is working with Assistant Secretary for Land and Minerals Wilma Lewis; Assistant Secretary for Policy Management and Budget Rhea Suh; and Senior Advisor Chris Henderson on the implementation program for restructuring of the agency’s oil and gas management missions. In addition, the Interior Department today issued a directive to oil and gas lessees and operators that requires them to submit information addressing the possibility of a blowout like the one on the Deepwater Horizon oil rig leased by BP that is still gushing oil into the Gulf of Mexico two months later. Information detailing steps they are taking to prevent blowouts must now be submitted when lessees and operators file for a new drilling permit, exploration plan, or development plan. “This is basic information that applicants should be able to provide,” Salazar said. “It should not delay permitting of appropriate shallow water drilling.” The Obama adminstration in May imposed a six-month moratorium on deepwater drilling in the Gulf of Mexico. This action came in response to a lawsuit filed by the Gulf Restoration Network and the Sierra Club in May against the Minerals Management Service for exempting oil companies drilling in the Gulf from disclosing blowout scenarios and ensuring that they have the capacity to respond to them. By law, oil companies are required to include blowout scenarios and discussions of oil spill response capabilities in offshore drilling plans. But a Bush administration adopted in 2003 and included in an April 2008 Notice to Lessees from the Minerals Management Service, MMS, told oil companies that they did not have to comply with the blowout disclosure and preparation requirements. The BP Deepwater Horizon rig and dozens of other deepwater exploration plans were approved despite the lack of this information. Although the federal agency has now invalidated the waiver for future drilling plans and for deepwater drilling that is subject to the moratorium, there are potentially thousands of other offshore wells that continue to pump oil without blowout scenarios and oil spill response plans, the groups said through their attorneys. The groups are represented by Earthjustice, a public interest environmental law firm, and the New Orleans law firm of Waltzer & Wiygul. “MMS is starting to do its job and hold offshore drilling in the Gulf to laws that can prevent disasters like the BP spill,” said attorney Robert Wiygul. “Given what we now know about blowout risks and inadequate capabilities to contain a worst case oil spill, MMS must require all offshore drilling plans to comply with blowout prevention and cleanup requirements,” said Earthjustice attorney David Guest. “The BP oil spill has laid bare fundamental shortcomings in the oil and gas industry’s ability to prevent and stop catastrophic blowouts,” said Salazar. “While the challenges of intervening in a catastrophic blowout are significantly greater in deepwater than in shallow water, all operators should provide basic information about potential blowouts, and steps that are being taken to reduce the possibility of a blowout,” he said. As a result of ongoing investigations and safety and environmental reviews, Salazar said the Interior Department may issue further notices to lessees requiring additional information for oil and gas exploration or development plans.